The dragon didn't get its nap. You know how they get when they don't have their nap. I thought this kid would like it if his balloon matched his shirt. I was bored around some Halloween decorations. 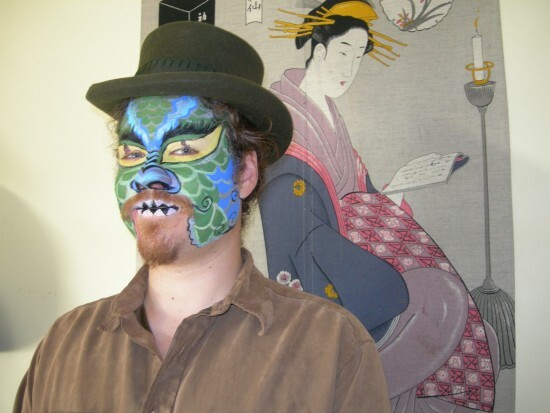 This Japanese style dragon was painted by Yenna, one of my very talented face painters. 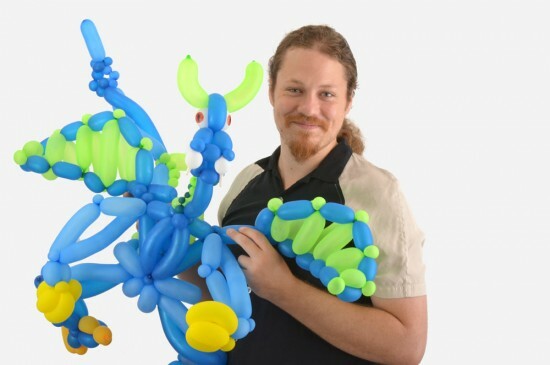 Hello, I am Dan the Balloon Man, I am the owner and one of the artists in my company Party Artisans. We offer balloon twisting entertainment, face and body painting, and even large scale balloon sculptures and decor. Thanks a lot! We don't always get a lot of reviews for the face painting, since we don't do it quite as much as the balloons. Anyway I'm glad your guests enjoyed it and thanks for having us! 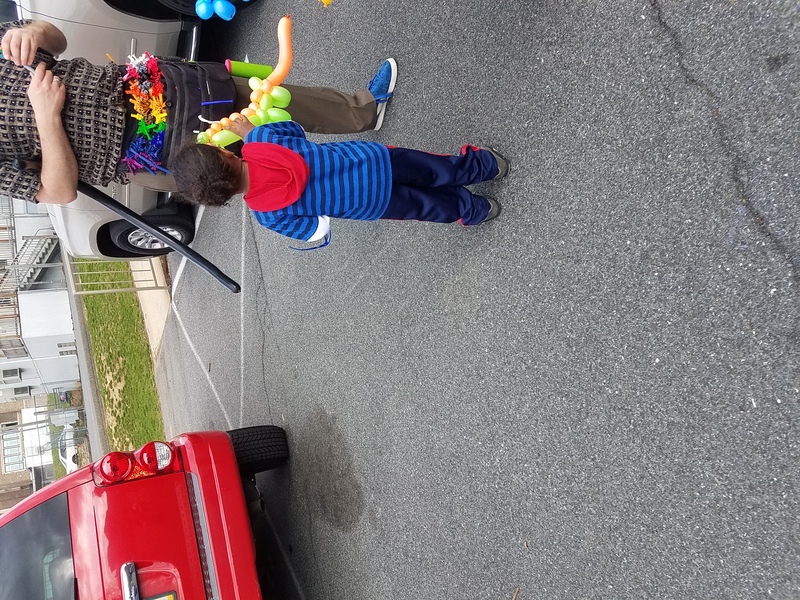 I recently gave my daughter a carnival theme birthday party and requested party artisans to create balloon animals and caricature drawings for our guest. All I have to say is they totally rocked the party! Dan and his team arrived on time and were ready to work. 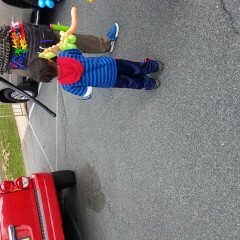 All the guest loved the balloon animals (the parrot seemed to be everyone's favorite. Everyone was a pleasure to work with. They were patient and very creative. The perfect addition to all the backyard carnival ideas I had set up. Thank you Dan for making my party a success. Thanks very much for having us, I enjoyed the creativity in the games and decorations you had set up as well! Dan and Rachel made our 7 year old's birthday party unforgettable! The kids loved getting their faces painted and running around the playground with their balloon art! So much fun! Thank you!!!! Thanks, glad to be there! I decided to have a balloon twister for my sons 7th birthday party and I wasn’t entirely sure what to expect, but it was so great! I believe the woman that came said her name was Tish. She was amazing! She was so friendly and fun! The balloons looked awesome and she was very patient and accommodating with a bunch of 7 year old boys that kept popping their ninja swords! She came prepared for face painting as well if we decided to add it to our party! (we did not because my son isn’t a big fan of face painting). I will definitely be keeping these guys in mind for future parties for my children! I'll pass on the good word to Tisha, we always love hearing we did a good job! Thanks for having me! I made a ton of balloons, even the folks working at the store started getting into it and got a few balloons! We hired Dan for an event at an adult day center. All of the members loved him! he was very talented and also very flexible. He did a great job going around and interacting with all of the people at the event. I would highly recommend! Thank you! Your little girl was very sweet. It was great seeing how excited she got for the pony and balloons! Dan made an amazing balloon sculpture for my Disney Pixar "UP" themed baby shower. Everyone at the shower was shocked by how gorgeous the sculpture was and couldn't believe the artistry involved. This was by far the best investment I had made and I would recommend Dan's services for any event. Amazing work, very professional and well worth the cost! Glad you liked it! It's always a little nerve-racking delivering these sorts of things, the fact you showed me a picture of what you wanted it to look like helped a lot! Dan was great! He arrived on time and was really good with the kids. 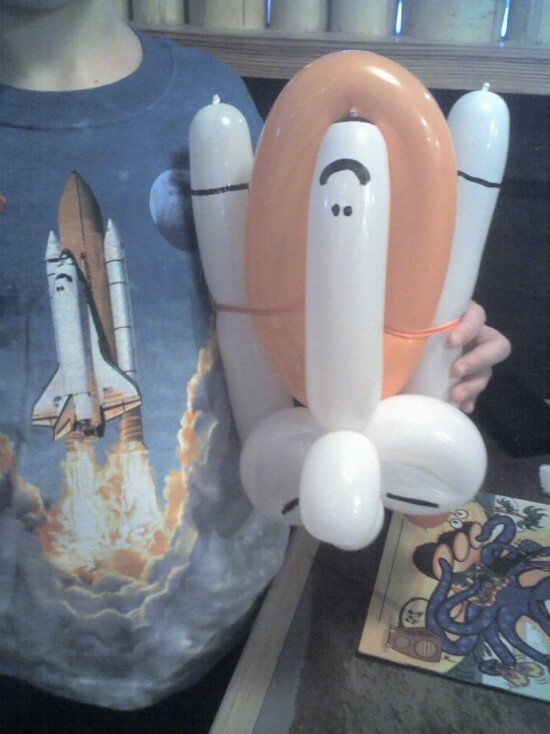 His balloon creations were also fantastic! Would definitely book him again. He was great! He worked the entire time. The kids were so happy with his work and I have adults asking about him for their parties. I would definitely recommend! Thanks again Dan! For my son’s baptism and 5th birthday party at Maggiano’s, I hired Dan and his face painter because my son really does not like events like these at restaurants. We had about 10 kids and EVERYONE had a blast. Even the adults were having their face painted and kids and adults were having light saber fights. My son is still paying with the balloons Dan made him over a week ago. It was a great event and his team was an amazing part of that! I was extremely satisfied with service from the communication while i was trying to decide to the day of my kids party. 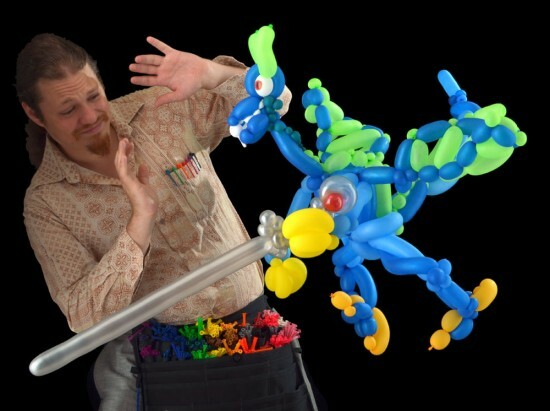 I reached out to Party Artisans about having a balloon artist at our community event. With families in attendance, I wanted something fun for the kids. Dan was really easy to work with, showed up on time and did an excellent job providing the kids with balloon figures to take home with them. He's very talented and I would highly recommend him to anyone who needs a balloon artist for their event! Dan the Balloon man is the perfect addition to any event! Dan the Balloon Man was referred to us from friends who throw the Ultimate Super Bowl Party. The referral was a godsend. Dan was just the extra something special our event needed. Leading up to our event he was easily accessible over e-mail and open to suggestions. He wanted to be sure he understood exactly what we wanted. On the day of all the back and forth communication to prepare for the event was worth it. Dan got right to work and amazed kids and adults alike. The sculptures he made were awesome. Next year, I think we might need to raffle them off because so many people wanted his art! We have booked Dan for future events and are lucky to have done so. You can't go wrong with Dan the Balloon Man! We had Dan at our daughters' birthday party and all of our guests loved what he did with the balloons! Whales, Phillies hats, dogs on leashes, elephants, lions and on and on! We are so grateful, Dan! Thank you for making the party a HUGE success!!!!!! Thanks for having me! I's great that I got to pull out the ol' whale design, no one ever asks for a whale! Dan did a fantastic job at our son's birthday party. He elevated the party to an event. There were even 15 year olds waiting in line for balloons. I would strongly recommend him to anyone who asked. Thanks balloon man! Dan was incredible. Kept the guests entertained the whole time. He met every challenge they threw at him and did an amazing job making the balloons from pictures. The party was teens ranging from 15-19 and they ALL had a great time. 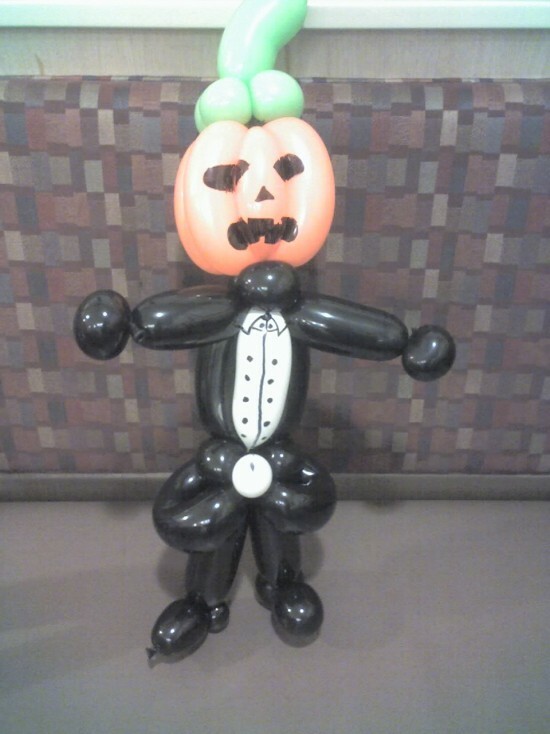 I was very impressed with his adaptability and his talent with balloon twisting. Insurance: Up to 5,000,000 - Not everyone requires insurance and not all of my artists are insured. If you need it, ask and I can send you someone insured up to 5 million, but generally we don't do anything dangerous. I started this company in 2011 because my balloon twisting business as Dan The Balloon Man was getting too popular to handle by myself. As such I started training more balloon artists, interviewing face painters, and scouting about for more talent. We currently offer a small selection of services, but all of them are a classy addition to any party. Eventually I want to offer all sorts of services and provide everything a partier needs to have a good time including entertainment, catering, and decor.